This chandelier will update your home with its eye-catching design. Featuring a matte black finish and matte opal shade(s), this fixture will accommodate a variety of dicor styles. With its easy installation and low upkeep requirements, this chandelier will not disappoint. 3-Light Matte Black Chandelier with Matte Opal Glass - 20 inch This chandelier will update your home with its eye-catching design. Featuring a matte black finish and matte opal shade(s), this fixture will accommodate a variety of dicor styles. With its easy installation and low upkeep requirements, this chandelier will not disappoint. 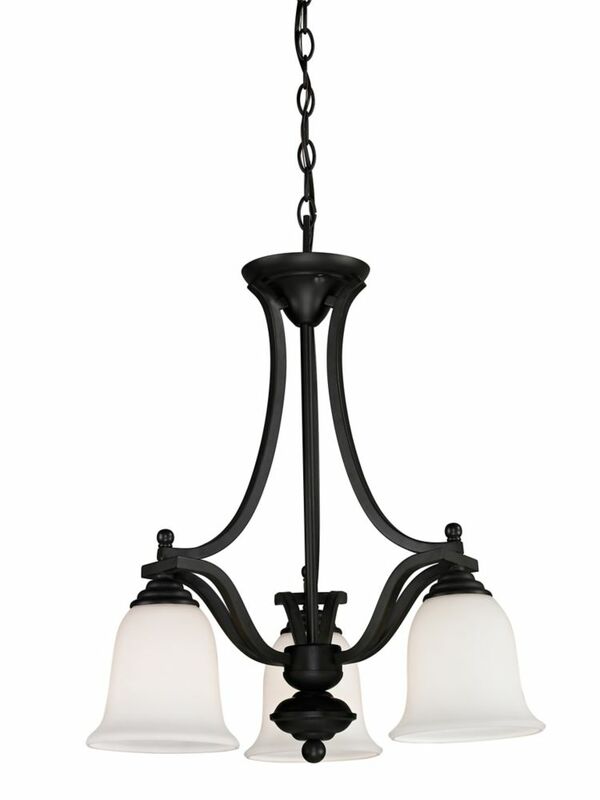 3-Light Matte Black Chandelier with Matte Opal Glass - 20 inch is rated 1.5 out of 5 by 2. Rated 2 out of 5 by Sue from After some tweaking looks good This light looks pretty good after some tweaks. The chain was difficult to install, you have to just pry it apart with strength (my husband and brother in law did it) then squeeze it back together. There is no way I could have done that myself. This left the chain scratched and we colored it in with sharpie. The ball on the bottom center went on crooked, we had to keep taking it off and tweaking it so it would go on straight. Even the glass shades did not go on straight the first time and we still have to mess with that. Other than all those problems, once the light is fixed, it looks good. I was disappointed with the assembly, and quality for the price of the light. The light has been installed a week or two, and is working fine. Rated 1 out of 5 by Gilbert from Piece of junk! This fixture came with one broken and two marred globes. The painted portion was flaking paint which revealed rusty looking (not clean or primed) metal. This was my worst experience with a Home Depot product. The light was returned for refund.